Sean Penn’s first stab at a book, “Bob Honey Who Just Do Stuff,” will bring him to Seattle’s Moore Theatre on April 11. It’s getting mixed reviews, but that part doesn’t matter to him. Everyone wants Sean Penn to stop smoking. “Please don’t smoke anymore,” Stephen Colbert pleaded on his show the other night. “Job security for oncologists,” Penn replied, tapping an ash. “I hope to,” Penn said. One thing the two-time Oscar winner is determined to give up? Acting. He’d much rather write. 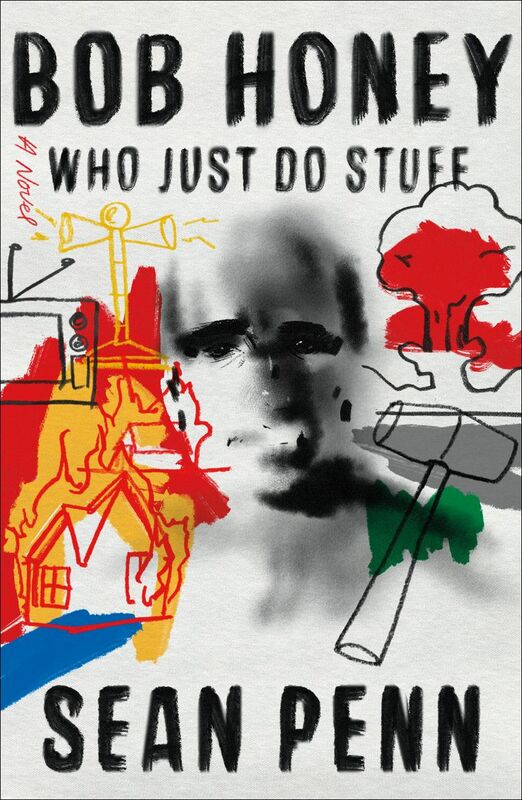 His first stab at a book is “Bob Honey Who Just Do Stuff,” an acid trip of a novel that will bring him to Seattle’s Moore Theatre on April 11. He will be interviewed onstage by musician and writer Duff McKagan. “Bob Honey Who Just Do Stuff” follows a septic-tank salesman who becomes a contract assassin who kills people — most of them elderly — with mallets. There’s a lot more packed into its 128 pages: A chubby ex-wife, a hairless love interest. A threatening letter to the President of the United States. A barge on the Pacific. A poem about the #MeToo movement. And a lot of alliteration. (“Vex of vertigo.” “Croaks, crisps and collapses.” And so on). “My sense, my side of the story is that wherever ‘others’ are — in this whole new dynamic of streaming and the way people are selling more than making movies — I felt increasingly apart from that, from playing with others. “I wanted to do something where there were no others, and express freely and get it done the way I see it without the pressure of other people’s money and egos and in any other way they may try to wake me up in the middle of my dream. Penn, 57, was talking from a house on Magaziner Street in New Orleans, where he is filming the Hulu series “The First,” from “House of Cards” creator Beau Willimon. The series follows the first human mission to Mars. The astronauts, their families, the crew on the ground. I asked Penn to describe his surroundings. “I am looking at my 5-month-old golden retriever, Flyboy, and I’ve got CNN with the sound off and the picture board with the Earth and Mars and the navigation of how to get there,” he said. His current mission, though, is a nationwide book tour. There was talk of author Tom Robbins interviewing him on his stop here, maybe his friend Eddie Vedder, but Penn’s team finally settled on musician and author Duff McKagan. I don’t know if I would go that far. But it did make a certain kind of sense when Penn said that he didn’t sit in front of a computer and look at what he was writing. He paced, smoked and dictated his prose to his assistant. The whole thing started as an audiobook he claimed had been written by someone named Pappy Pariah, who he met in Key West in 1979. The response was tepid, he dropped the pseudonym and started revisions in earnest. “I think the intention was that it would have some little impact on the election if it caught an audience, but it didn’t,” he said of his early attempt. “Then after the election that I had no success in manipulating — I guess I didn’t have enough Russian blood — I started to really go at it. He wrote in between film projects, finishing the book in about two years. “It is a book that is meant to be a little bit of work,” Penn said. “I didn’t try to make it an easy read, per se, because of the nature of the character, Bob Honey. Penn doesn’t feel vulnerable to critics. He doesn’t even care what his kids think. He’s just having a great time as an author. Writing. Laughing. Smoking. “At this stage in life, and the fun I had writing this,” Penn said, then paused. “I have to tell you, I have been the last 26 years, among other things, a parent. And my kids, both of them, see me mostly as a guy who, when he thinks something is funny, will laugh when no one else does.